Revitol Skin Eye Cream in Malaysia = RM185 per tube. Thank you for this wonderful information you share. 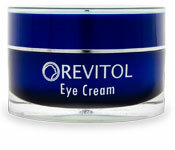 how many ml for the revitol eye cream? Sorry, I still have a question to ask. After searching the information of this products, it were giving money return warranty for 90 days for those who not satisfy with the products? Am I correct and it the guarantee from you? Thank you. Yes but please read the tnc, if the bottle seal is open already, then cannot refund.